SANTA FE – White-winged dove, mourning dove, dusky (blue) grouse and squirrel seasons are open statewide. These hunts offer great opportunities to get a new hunter out in the field. The weather tends to be warmer and good opportunities exist with minimal hiking. White-winged and mourning doves can typically be found throughout the state in warmer, open habitats, around water and near farm or agriculture fields. New Mexico has two hunting zones, North and South. The dividing line starts at the Arizona/New Mexico border and runs along I-40 to US Highway 54, in Tucumcari, and then north along US Highway 54 to the New Mexico/Texas border. The seasons in both zones start on Sept. 1 and run through Nov. 29 in the North Zone and through Oct. 28 in the South Zone. The South Zone will reopen Dec. 1 through Jan. 1, 2019. The bag limit is 15 singly or in aggregate per day, with no more than 45 in possession. A Harvest Information Program (HIP) number is not required for Eurasian collared-dove, there is no bag limit and the season is year-round statewide. Dusky (blue) grouse can typically be found in high elevations (above 7000 ft.) Prime areas can be found where forests meet open spaces and in stands containing fir trees. Statewide hunting season for dusky (blue) grouse opens Sept.1 through Nov. 30. The bag limit is three per day, with no more than 6 in possession. Abert’s, red, gray and fox squirrels are typically located in forested areas. Mountainous areas with ponderosa pine, oaks, and fruiting shrubs are good areas to search. The season is open Sept. 1 through Nov. 30 and has a daily bag limit of eight singly or in aggregate per day, with no more than 16 in possession. To hunt any of these species you must have a game hunting license, habitat management and access validation, a habitat stamp if hunting on BLM or USFS lands, and a hunter education or mentor youth certification if under 18. In addition, white-winged or mourning dove hunters must also obtain a HIP number. For more information about small game hunting opportunities in New Mexico, please call customer service at (888) 248-6866. 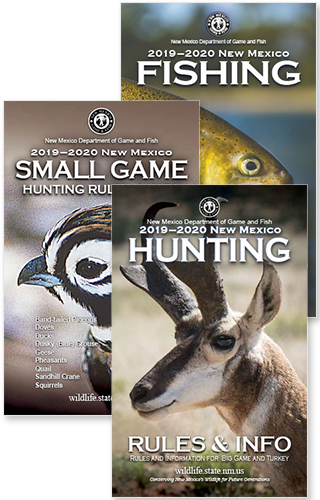 The 2018-19 Hunting Rules and Information books are available online at www.wildlife.state.nm.us.